Travel writer Carveth Wells’ North of Singapore is probably one of my favourite books on the region, and of the travel literature genre. And so this review is likely to be long, involving much gushing and a few interesting tidbits on the region. Anyway. North of Singapore‘s title, while accurate, is a little misleading as to its scope. The journal is of a tour of the entire Asian continent which lies to the north of Singapore, and not just Malaysia. What’s especially interesting about this book is, it was written during Carveth Wells’ tour in 1939, when the world was at the brink of war. And so it is as much a world-at-war account as it is a travel one, which gives us a rare glimpse into the climate of the world at the beginning of World War 2. 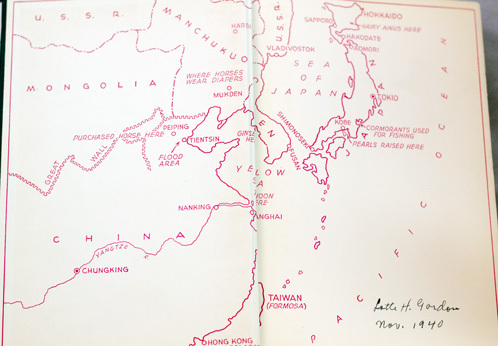 Wells encounters, for instance, the Japanese Occupation of China and Korea (Manchukuo), as well as a nervous British Hongkong anticipating a Japanese invasion. He gets caught in a monstrous flood in China and sees dead bodies floating around by the hundreds, and experiences anti-colonial sentiments throughout the region. Another interesting thing about Wells was his deep involvement in Malaya – this book was written during his second voyage to Asia, but his first encounter was as an expatriate posted here to construct the Federated Malay States Railways, as well as the Causeway we all use today. He worked here as an engineer for 6 years, during which he learned Malay and explored the wildlife of the archipelago. And his attachment to the region is obvious as he hunts down his old homes and construction sites in 1939, 20 years after leaving the region. Of course, by this time, much has changed. “I know no place on earth where so much can be seen and done in a short time. The streets were jammed with strange looking people dressed in brightly colored costumes. In a few minutes I saw the following unusual sights: Sitting on the sidewalk was an Indian being shaved by an itinerant barber who carried all the water he required in a small bottle and wiped his razor on his wrist. Then along came a holy cow being led by a man who carried a large basket containing small bunches of grass which people bought and gave to the cow. On inquiry I was informed that the man was a farmer who had taken an oath that his cow should never do any more work, not even graze. This meant that for the remainder of the cow’s life, the man had to cut grass for it. The owner of the cow evidently made quite a good living as a result of his oath. The next sight was a grand piano being carried through the streets on the head of eight men, all of whom had to trot in perfect unison, otherwise the piano would have crashed to the ground. Just then I happened to peep through an open gateway into a courtyard in which I saw half a dozen funeral pyres. On one, the corpse had only just been placed on the pile of wood and the fire was about to be started. Another was blazing away furiously while the rest were dying down, not a vestige of any corpse being visible.